Kompatibilität: Benötigt iOS 3.1.3 oder neuer. Modern Combat 3: Fallen Nation is coming this fall! Watch the exclusive trailer on YouTube : http://bit.ly/oV9zvX Check out the new update below! Finish what you started. 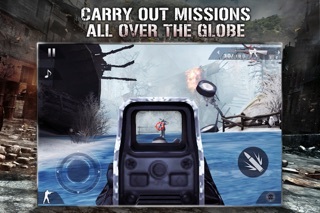 In Modern Combat 2: Black Pegasus, complete the mission unveiled in the first opus of one of the most acclaimed FPS games on the iPhone, this time on fronts all over the globe. 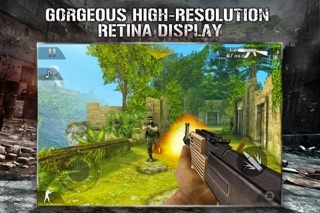 “Modern Combat 2: Black Pegasus looks like a big step forward for the series.” SlideToPlay “I was impressed with the console-quality graphics and gameplay elements.” PC Mag Modern Combat 2: Black Pegasus further improves the exemplary gameplay of the first Modern Combat for an astounding immersion in a modern war experience and one of the most complete FPS multiplayer games on the iPhone. AN IMPECCABLE PRODUCTION ENHANCED BY THE MOST TENSE GAMEPLAY YET - The original control modes (Default, Screen Tap, Virtual Sticks) have been further refined for an impressive gameplay fluidity. - A new full gyro advanced control mode has been added for even more gaming comfort. 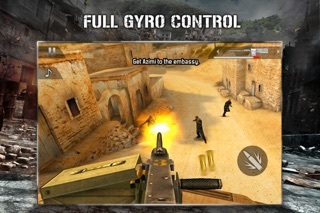 - Gyro-based QTEs and improved headshot sensations add to the stunning intensity of the gameplay. A STUNNING DIVE INTO THE HEART OF A GLOBAL MODERN CONFLICT - Embody one of the 3 playable characters and throw yourself into 12 battlefields set in the Middle-East, Eastern Europe and South America. - Facial animations and instant-kill slow-motion create a breathtaking sense of immersion. - 15 weapons from real military forces that you can gather directly from your enemies and upgrade with several accessories. - Blur effects when taking fire and dynamic lightning on your weapon contribute to the realism of the war experience. THE MOST COMPREHENSIVE FPS MULTIPLAYER EXPERIENCE ON THE APP STORE - Engage in 10-player online and local confrontations. - Choose between 4 multiplayer modes: Battle, Team Battle, Defuse the Bomb & Capture the Flag. - XP progression through 72 ranks, reward messages, unlockable weapons and leaderboards ensure heated multiplayer competition. 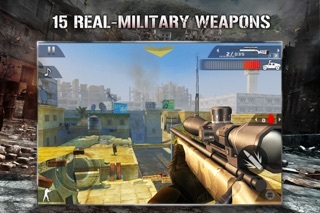 - Gather your squad and face your favorite foes through Gameloft LIVE! *************************************************************************** Follow Gameloft on Twitter to get more info about this game and all our upcoming titles at http://twitter.com/gameloft or read our official blog at http://blog.gameloft.com/ I found a new @Gameloft Game! 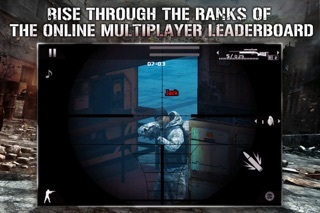 Modern Combat 2: Black Pegasus: http://bit.ly/blackpegasus #222 Join the hunt: http://j.mp/GameHunter and follow @Gameloft! What's this? http://j.mp/GameHunter Certain apps allow you to purchase virtual items within the app and may contain third party advertisements that may redirect you to a third party site.